''Elephants are majestic creatures & true masters of the Jungle. Apart from humans, they are the only creatures that are capable of altering their eco-system. They can push down trees and pull down branches. By doing so they ensure that there is enough decaying material in the forest to enrich the forest floor. Because they are destructive to their surroundings, nature has intended them to be highly migratory. Elephants, in the foothills of western Himalayas, migrate from Rajaji National Park eastwards and all the way upto Nepal Tarai. 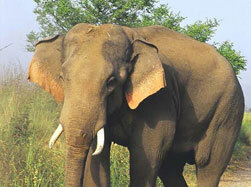 Sonanadi Wildlife Sanctuary is an important elephant migration corridor connecting Rajaji and Corbett. Their estimated populations in Corbett range from 450-550 animals.